"Both Russia and China are developing hypersonic capabilities," Air Force Gen. John Hyten, commander of the Omaha-based Strategic Command said. "We've watched them test those capabilities. So both Russia and China are aggressively pursuing hypersonic capabilities." Hyten explained that hypersonic missiles are launched atop ballistic missiles and then fly at ultra-high speeds along a depressed trajectory like a cruise missile or aircraft. They can be armed with either nuclear or conventional warheads and are difficult to counter. "It goes up into the low reaches of space and then turns immediately back down and then levels out and flies at a very high level of speed. That's a hypersonic weapon," he said. Asked by Sen. James Inhofe (R., Okla.) if the military has defenses against the hypersonic missiles, Hyten said there are no current defenses against the missiles that travel faster than 7,500 miles per hour. 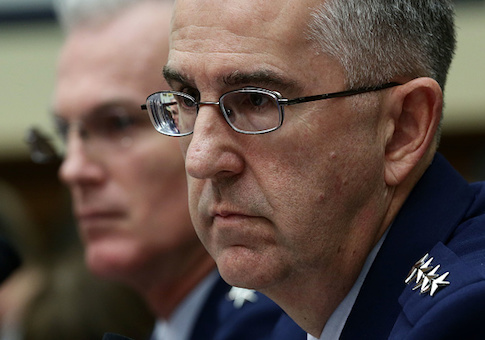 "Our defense is our deterrent capability," Hyten said. "We don't have any defense that could deny the employment of such a weapon against us, so our response would be our deterrent force which would be the triad and the nuclear capabilities that we have to respond to such a threat." The triad is the combination of land-based and sea-based nuclear missiles and nuclear bombers. Hyten testified before the Senate Armed Services Committee that adversaries are developing hypersonic missiles that will be deployed "in the next few years." China has conducted several tests of a hypersonic glide vehicle that is used to "defeat missile defenses," and Russia's hypersonic glider is maneuverable and one of six new strategic weapons announced recently by Russian leader Vladimir Putin, Hyten said. "As our competitors continue to move fast in this area, we must retake the initiative and commit the necessary resources to develop and field hypersonic conventional weapons," Hyten said. The general said the United States is ahead of China and Russia in some areas of hypersonic technology but lag behind in others. "As a whole, I'd say it's a competition and it's a competition, I believe, that we should have a goal of winning that competition; not tying, not losing, but winning the competition," he said. Hyten declined to discuss the areas where the United States is behind foreign competitors in the hypersonic arms race. "The areas [we are] ahead in, we should accelerate further," he said. "We need to make sure that that becomes a priority for our nation." The next step is a U.S. response "and the first way to respond to it is to be able to see the threat, which, right now, is challenging. So we have to build capabilities to see what the threat is as well," he said. The military needs better sensors to track, identify, and trace the origin of such missiles. "And right now, we have a challenge with that, with our current on-orbit space architecture and the limited number of radars that we have around the world," he said. To better detect hypersonic missile attacks, the military needs a new space sensor architecture, Hyten said, something being studied by the Pentagon's Missile Defense Agency and the Air Force. The current defense bill contains $42 million for the new space sensor architecture prototype. "I'm going to advocate, as I've advocated for the last 30 years, that we need to move into space and be able to build sensors to conduct both the characterization of these new threats that are appearing, as well as discriminate better and earlier the midcourse element of the threat that exists today," he said. Asked about Chinese and Russian improving strategic capabilities, including hypersonics, Hyten said both militaries are "closing in" on U.S. advantages. "I think we have stability with Russia on the nuclear side," he said. "We have advantage with China on the nuclear side. But they are gaining ground quickly, especially when you look at space and cyber." U.S. efforts to counter the new high-speed missile threats are being addressed in the Pentagon's Missile Defense Review, the four-star general said. "The [Defense] Department is pursuing hypersonic capabilities along several lines of effort, but we need to prioritize and accelerate development if we are to field our own capability in the near term," he said. "New long-range, survivable, lethal, and time-sensitive strike capabilities, such as a hypersonic [conventional prompt strike] weapon, will allow the U.S. to achieve its military objectives in these environments," Hyten said. "This new weapon class prevents adversaries from exploiting time and distance and provides additional response options below the nuclear threshold." The Navy successfully tested a conventional hypersonic missile in November from a converted Ohio-class conventional missile submarine off the coast of Hawaii. The objective of the rapid strike capability is to hit a target any place on earth in 30 minutes or less. Hyten also testified in support of U.S. plans to deploy two low-yield nuclear weapons, one on a small number of current submarine-launched ballistic missiles, and on a new sea-launched nuclear cruise missile fired from ships or submarines. Some Democrats expressed opposition to the new low-yield weapons. Hyten said they are needed to provide deterrent options for similar Chinese and Russian nuclear forces. "The threat is from both Russia and China that drives the need for the sea-launched cruise missile," he said. On Russia's deployment of a ground-launched cruise missile in violation of the 1987 Intermediate-range Nuclear Forces Treaty, Hyten said Moscow is continuing to produce and deploy the illegal SSC-8 missile. Hyten also said he does not favor removing space from the Air Force and creating a new space corps. Someday, we'll have a space corps or space force in this country," he said. "But I don't think the time is right for that right now." President Trump said in a speech in California last week that he is considering creation of a new space corps based on the emergence of space as a new warfighting domain, along with cyber space. Asked about the Iran nuclear deal and whether the United States should withdraw from the agreement known as the Joint Comprehensive Plan of Action (JCPOA), Hyten said the issue is for policymakers and that his role in assessing the accord is to examine Iranian compliance. "And, as I sit here today, Iran is in compliance with JCPOA," he said. "But JCPOA is about nuclear, and, from a command that is nuclear, that's an important piece to me because it allows me to understand the nuclear environment better," Hyten added. "But it doesn't say anything about Iran as a global sponsor of terrorism or Iran as building huge numbers of ballistic missile to threaten their neighbors and potentially us someday." "All of those will be the decision that a policymaker has to make, but my job is to look at the nuclear capabilities and make that recommendation, which I've done," he said. On Russia's plan to use nuclear weapons early in a conflict, a policy that has raised fears of a nuclear conflict, Hyten said Putin announced in 2000 that Russian planned to develop and use low-yield nuclear arms.